Stock photos are tough when it comes to content marketing. Content marketing is more popular than ever. On average, B2B marketers are allocating 28% of their marketing budget to content marketing. The reason is that customers report wanting to read content from industry thought leaders and from companies (96% of B2B buyers, in fact, want more industry content). Many are finding success, but others are finding content marketing to be a struggle. There are a few things that could be the cause. First, frequency is an issue. In blogging, for example, companies that publish more than 11 posts each month see 3x more traffic than companies that publish 0-1 posts. Second, promotion can be an issue. Publishing content is challenging work. It’s not easy to create a blog post, podcast, video, etc. You can publish and slowly build traffic to the content through inbound channels like search engines, but it’s important to put the same effort into promoting your content. Email lists, social media, guesting and more all take effort, but many companies overlook the promotion aspect of content marketing. There are other potential issues and one that might be a bit overlooked is design. That’s what we’re going to look at today. What design issues could your content have that is holding it back? Clutter is a big one no matter what the medium is when it comes to design. You’ll often see it on websites. I know I’ve been guilty of it with this website. The feeling is that you want to think about every possible decision a visitor can make. You want to give people options and feel like you’re not leaving anything out. But that gets you into trouble because when things get too cluttered it almost paralyzes the person looking at the design. One example that’s been discussed is the grocery store. If you walk down the aisle wanting to buy chips, but there are hundreds of different options it’s challenging. But if there are five or so then you can make a decision. Or you’re at the restaurant with a huge menu versus one with a smaller menu. When it comes to content marketing, look to remove information. Cut down that infographic. Take those sidebars and popups off the blog post. Identify one path you want people to take and make that the main focus. Let’s build on the idea of too much information by looking at distractions. The way I look at this situation is that clutter is a distraction, but you can have only two focuses for the content and one can be a big distraction for the other. An example of a distraction in content marketing would be a popup on a blog post. It might be a big logo in the middle of an infographic. It could be a break in the middle of a podcast. It’s a tricky thing to brand your content marketing. You want to get people to take action. You want them to know that you’re the one creating the content, but you don’t want to make the experience negative. People go to content for the content. They don’t want to be distracted until they’re done with the content. That’s the appropriate time to ask for things like email addresses or to get people to view services pages. One of the things that drives me nuts is looking at a blog post that has no headings or no breaks in the text. Big blocks of texts are intimidating. You see it often with blog posts, but you’ll also see it with other forms of content including infographics and even in other areas like podcasts and videos. People need breaks. The mind can’t focus for extremely long periods of time. We like to scan. We like to skip ahead and go back when we’re reading and consuming content. Use things like headings and breaks to help people consume your content. If you don’t and it’s too difficult they’ll just ignore what you’re creating. Another subtle one here that’s similar to the previous ones, but there’s an important distinction. Let’s say you have an infographic. It’s got great information. There aren’t any distractions. It flows well and is easy to understand. Then at the bottom you have a place for an ebook download, but right next to it you have the sharing buttons and you also have a little colorful ad that promotes your product or service. It takes discipline to focus on a single call-to-action, but it really works better. The companies that I see doing the best with content marketing focus on one call to action. At the very least they make one call the main focus and then use design to make any others kind of blend into the background. They’re there, but they’re not as prominent as the main call. I see this a lot with infographics. I think it relates to the first point of having too much information, but it’s worth calling out from a design perspective. When the font is too small it’s really difficult for people to read, obviously. But you see it often even on some really good infographics. Yes, many will have the option to open a larger version of the graphic, but should that really be necessary? I like when the font is easy to read without any manipulation and it seems that others feel that way too. This one can throw things off. I struggle with it often with blogging. It’s difficult to find good photos to use in blog posts and on other content like ebooks and white papers and more. Even on websites you’ll see this struggle. I know that a cheesy stock photo can distract a reader on a blog post. It can make them pause in a bad way and it can lead to them not trusting the content or not taking it seriously. Things have gotten really good with photography with sites like Unsplash and Pixabay, but you still have to be careful. And using a professional designer for illustrations and things like that can be really worthwhile especially if you’re already investing in the content for the content marketing. Type I guess could be font. I see it sometimes with designs like infographics. You’ll have great information and even great illustrations, but then there is a weird font like a Comic Sans type thing or something like that. Designers can be really good with finding the right type or font. Lean on them to help you. I know that I need help with it because if it was my choice then everything would probably be Arial. It can be easy to lose focus with content especially with large pieces of content. I know it can happen with long blog posts. You could have a post like 51 Ways… or something like that and three-fourths of the way through you kind of start losing momentum and the ideas start to lose consistency. That’s with the content, but it can also happen with design. Using different designers can lead to issues of consistency. You want your content to have a consistent design even if you’re publishing on different platforms. You want your videos to share branding and style with your graphics and also with your website and more. This one builds on the last one. Sometimes content can feel unorganized. An infographic can feel a little all over the place. You have one stat here then some statements and then more stats and they don’t seem to flow well together. The best designers are able to make it all flow well. It feels organized. It feels like you’re moving through the information in a normal and comfortable way. It’s not always easy to do, but it’s important and it often starts with planning ahead before you write the content or create the design. We’ll end with the issue of branding. When you’re creating content you want people to know the brand or the person behind the content. You want your infographic to have your logo at the end or possibly at the top. You want your blog posts to be on your company website with the logo at the top and probably in the footer. The same with video or podcasts. The brand is important because if people don’t know who created it then they won’t care and they’ll just move on. Design is important when it comes to content marketing. You want to have good research and good text. You often need to promote the content to make it successful, but many overlook the importance of design. It’s not something you can overlook when it comes to content marketing. It has to look good, but it also have to function. 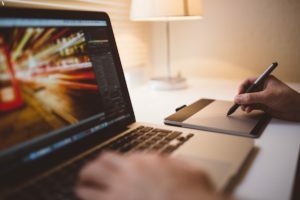 These are some of the things to watch for and getting a good designer on the team can be vital for content marketing success and marketing success in general.